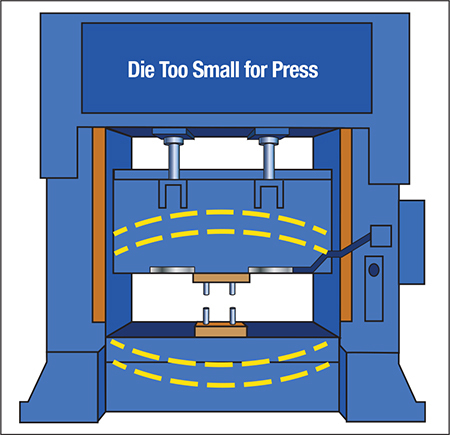 There are four areas with which die-setters must be intimately familiar in order to ensure safe and accurate setup of stamping dies: press capacity, coil-feed-line capacity, feed accuracy and coil payout. Here’s what you need to know about each. Every mechanical power press is designed and manufactured to operate within the capacity limits set forth by the press manufacturer. Capacity limits dictate which dies can safely run in the press. Generally, these will include press tonnage, press energy, stroke length, shut height, bed size, off-center loading limits and stroking speed. The tonnage rating of a press is the maximum load that a press can withstand under normal operating conditions without causing damage to its structure or drivetrain. Keep in mind, this rating assumes that the die length spans across at least two-thirds of the press slide. 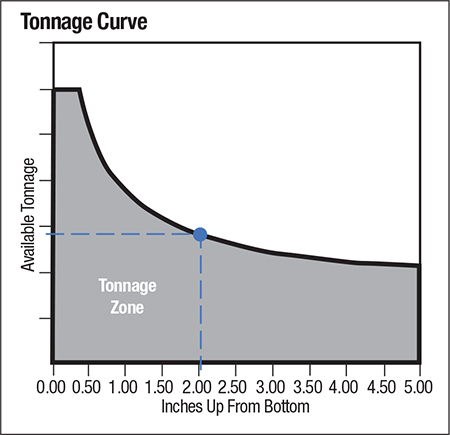 When the die covers less than two-thirds of the slide length, the maximum allowed tonnage is reduced substantially in order to prevent damage to the slide caused by concentrated loads applied between the pitman connections (see Fig. 1). Tonnage ratings for mechanical presses are specified at a small distance above the bottom of the press stroke, usually between 1⁄32 in. and 1⁄2 in. above bottom dead-center. When a mechanical press must work higher up in the press stroke, as is the case for deep drawing, less tonnage is available due to the reduced mechanical advantage of the pitman connections (Fig. 2). Deep drawing consumes significantly more press energy than conventional stamping, especially when working at slower speeds. When considering force and energy requirements for deep drawing, the attributes of a hydraulic press should also be considered. Hydraulic presses provide maximum force throughout the entire stroke distance and can provide higher forming-energy levels than a mechanical press of equivalent force rating. Uncoiling, straightening and feeding are the three basic functions performed by a coil-feed line. A reel, cradle or pallet decoiler may perform the uncoiling function. A powered straightener, pull-through straightener or a straightener-feeder combination can perform straightening to remove coil set. Coil feeding, which moves material into the die in precise lengths at a predetermined rate, can be performed by air feeds, mechanical roll feeds or servo-driven roll feeds. Other coil-handling products and added equipment features enhance material loading, threading and removal procedures. These may include loading cars or ramps, turnstiles, cropping shears, threading tables and threader-peeler systems. Three basic types of coil-straightening equipment are available: traditional spread-center straighteners (sometimes called flatteners), precision close-center straighteners and precision roller levelers. It is critical that the die setter understand the capability and limitations for each machine type. Coil straightening is accomplished by bending and unbending the incoming coil material around several sets of rolls that alternately stretch and compress the sheetmetal’s upper and lower surfaces. Each bend works the material past its yield point until both surfaces end up having the same surface length. The number of rolls in a straightener correlates to the number of yielding strains (bends) it can produce, which in turn determines the extent of possible shape correction. The die setter must properly set and adjust the roll depths for each coil width/thickness/strength combination to assure the best results and to prevent damage to the straightening equipment. Setting the feed system properly, including the pilot-release function, can be challenging for the die setter but is critical for successful progressive-die stamping processes. While highly accurate feed systems that practically eliminate the need for pilots in a die are available, there are many older feeds still in use that will overwork pilots beyond their original design intent if the feed is not set properly. In both situations, die setters are relied upon to properly adjust or to program the feed to accurately position the coil strip in the next die station. This avoids inconsistencies in product quality and the likelihood of tool breakage or premature wear. The pilot-release function, often referred to as feed release, allows the strip being fed into the die to be released so that the pilots in the die can properly position and register the strip. For the pilots to position the strip correctly, the feed rolls must unclamp the strip before full pilot entry. If the feed rolls open too soon—before the pilots enter the strip—the strip could pull out of position due to the weight of the material in the feed loop between the feeder and the coil. Single-end coil reels are available in powered and unpowered models. Features may include a variable-speed drive, loop-arm speed control, and hydraulic arbor expansion. Double-end coil reels are motorized to pay out material to a servo-driven straightener-feeder. The reel is equipped with side guide rollers, powered indexing, powered mandrel expansion and dual hold-downs for increased safety. Noncontact loop controls and coil cars also are available for both types. Die setters must be properly trained in the use and application of all available features in the feedline.